Not very long ago I returned from having spent a year in Aberdeen in Scotland while following a university course there. Just before going, I obtained my radio amateur license as I was getting more and more interested in how radios work and excited about the idea of making radio-related equipment. I knew in advance that the local hackerspace over there was toying with amateur radio as well, so this seemed like the perfect time to get into it. During that year I've been involved in numerous radio-related activities and projects, some of which I intend to describe on this blog. Right, on to the matter at hand. Living in accommodation provided for by the university introduced a significant challenge for me if I wanted to operate on HF. 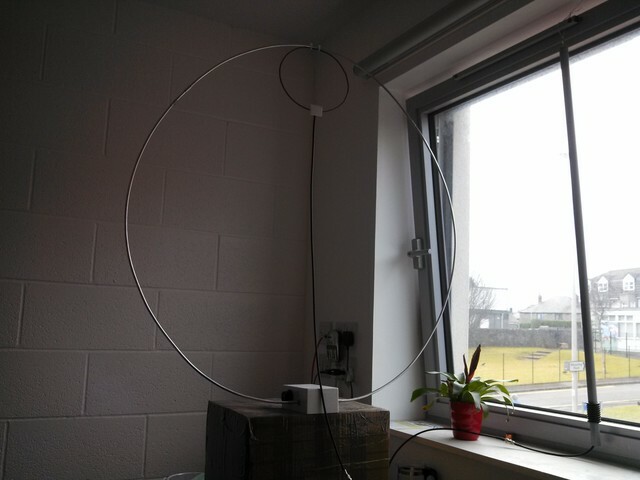 I did not have any real way to put an antenna outside nor did I have an option to route a cable from outside to inside, so I was restricted to indoor antennas only. That didn't stop me from eventually buying a second-hand mobile HF radio (an Alinco DX-70, should you want to know), and I was keen to make the best out of the situation and at least try something out. From one of the kind space members I borrowed a QRP antenna tuner. I've experimented with many lengths of wire in different orientations, but whatever I did the reception would be poor and transmissions would cause significant interference (my computer keyboard came to life for example). I looked for alternative antenna designs online and discussed my challenging situation with other local hams, which led me to look into the magnetic loop antenna. This type of antenna is a lot smaller than its more popular alternatives and is also a lot less efficient. However, it is much less prone to noise from local electrical equipment, and should outperform other compromise antennas due to its high Q factor. Being surrounded by other students with laptops, gaming consoles, TVs, phones and tablets, reducing the noise level appealed to me. The magnetic loop is fairly simple in its design and there are various ways to feed it. I will not go into detail about its design as plenty of others have explained this much better than I could already. 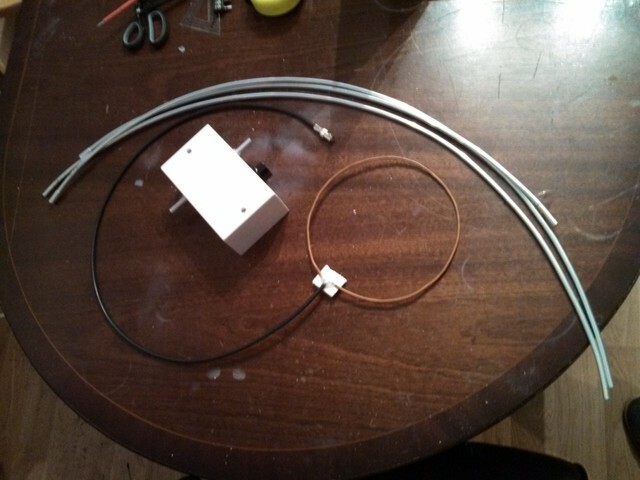 At the end of the article I will list some resources that have given me the information I needed to make this antenna. In my situation, I used aluminium tubing of 6 mm (and 8 mm for bridging two tubes) for the radiating loop, and I chose to feed it by using a smaller coupling loop made of solid core electrical wiring. While aluminium was perhaps not the most ideal choice, the tubes were locally available, they were cheaper than copper, and they were light and thus made for a more portable antenna. The air capacitor was gifted to me. Determining the loop size was simple, I chose a diameter just under the height and width of my one bedroom window so that I could put the loop behind it. Various formulas and calculators for magnetic loops are available online and with my chosen diameter it seemed I should be able to cover the 20 metre band and perhaps a few lower bands, depending on the used air capacitor and tolerable efficiency. Last but not least, something had to keep the loop in place and house the air capacitor. The local hardware store did not offer a huge choice in project boxes, but I did however find cheap but sturdy pattress boxes and matching blank covers. These turned out to be ideal for this antenna. I was positively surprised by the performance of the antenna. It turned out that I was able to tune all the amateur radio bands from 15 metres down to 60 metres with the air capacitor I used. On the lower bands however, the decreasing efficiency became noticeable and I generally stayed within 15 to 30 metres. 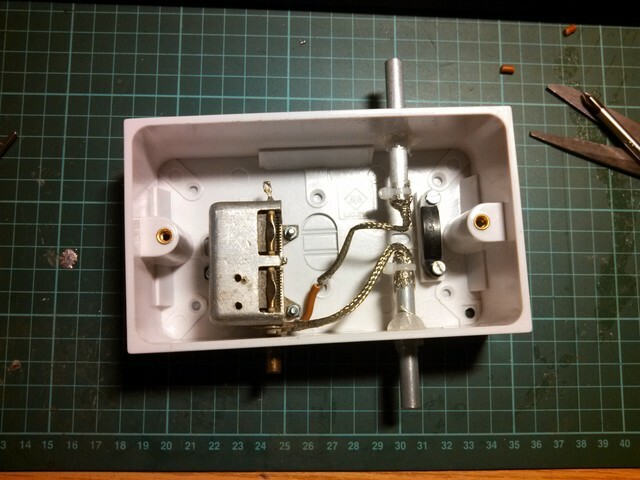 My radio is capable of outputting 10W or 100W, or if an internal switch is flipped, 5W or 50W. I could hear sparks flying between the plates of the air capacitor at 50W, but 10W did not cause any issues. At this power, I've made over a hundred QSOs on this antenna. My furthest QSO with this setup was with N2LD in New Jersey in the US. Not bad for such a small antenna on my desk in front of the window if you ask me. In the end I have to conclude that if you are operating in very limiting circumstances like I was, the magnetic loop may be the antenna that will get you on the air. Not just that, with some persistence you'll even work some DX. If you do have an option to put something outside, even if it is just a long wire out the window to a nearby tree, then that will likely be a better bet. However, each situation is unique, so experiment!